RF Products – Antennas, Satellite Modulators, RF Routers and Switches, RF Splitters, RF Distribution Amplifiers, Demodulators, Fibre Transport, Power inserters, Power Amplifiers. Control, Orchestration, Monitoring and NMS – VistaLINK NMS, Magnum Unified control, Remote monitoring, Closed Caption monitoring, XDS Monitoring, Data Monitoring, Monitoring conversion, Transport Stream Monitoring, Multiservice Bi-directional HD/SD/ASI + Ethernet transport, SONET/SDH Transport. FacilityLINK Fibre and Transport Solutions– Advanced Optical Transport Platform, Passive Optical Splitting, Passive Optical Multiplexing, SFP Based Solutions, Audio/Video Transport, Dark Fibre transport, WDM/CWDM/DWDM Multiplexing, Optical Splitters, Bypass pass switches, EDFAs, Optical Regenerators, RF Transport, Portable Fibre Optics. IP Solutions – As the industry migrates towards an IP-centric facility, Evertz’ Software Defined Networked Orchestration allows content providers to seamlessly transition from SDI to IP without compromise. 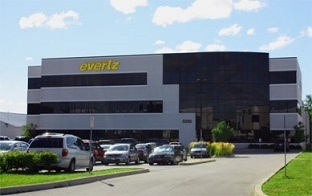 Leveraging Evertz high capacity switch fabrics (including EXE and/or 3080IPX) with Evertz MAGNUM unified control system, the SDVN solution can be applied throughout the facility for production, playout and WAN distribution. Evertz’ SDVN offers broadcasters, content distributors and service providers a flexible, format agnostic and scalable infrastructure for SD, HD, 3G, and Ultra HD (4K and 8K) video.